Dr. Laura Brutscher, a honeybee researcher with a doctorate in immunology and microbiology, recently published a study in the journal Scientific Reports detailing the mechanisms honey bees use in order to fight viruses. According to Brutscher, “This project has taken a lot of patience, time, and perseverance, so it’s personally validating to know that my work has been accepted by the scientific community.” This study was co-written with Brutscher’s doctoral adviser, Michelle Flenniken, an assistant professor with Montana State University, as well as Katie Daughenbaugh, who is a research associate in Flenniken’s lab. In the published paper, Brutscher describes how she tested honeybees in order to verify the genes involved with defending them against viruses. During the study, Brutscher infected over 500 honeybees to see which genes reactivated to the viral infection while also investigating the role double-stranded RNA (dsRNA) played in triggering antiviral defenses. This type of RNA is one viruses produce while infecting a host. Ultimately, the experiment showed dsRNA-treated bees were better able to fight viral infection compared to untreated bees, per Brutscher. Using the latest in RNA sequencing technology, Brutscher concluded which genes turned on in various circumstances. 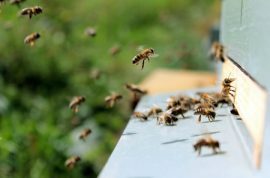 Hundreds of genes activated, but she focused specifically on two genes that could be key to building honeybees’ antiviral defenses. “If these genes prove to be important for honeybees to fend off all viruses, then we could selectively breed colonies that have greater expression of these genes,” says Flenniken. However, further research will be necessary before these genes can be incorporated into the many important criteria for selective honeybee breeding programs, which includes docility and mite resistance. Flenniken, who co-directs MSU’s Pollinator Health Center, said researchers are determining the pathogens that correlate with colony losses and poor bee health, but, as of yet, no one can identify a specific pathogen responsible for the many colony deaths. This is likely because there are multiple factors at work, such as pesticide exposure, various other pathogens, and a lack of substantial habitat and forage. Flenniken cited several reasons as to why honeybee health is so important, including that colony losses have been averaging a 33 percent annual loss rate since 2006, which is almost three times the previous historical rate. Investigating the factors affecting honeybee health applies to both environmental and human health, per Flenniken, with bees pollinating over 180 crops, including healthy fruits, vegetables, and nuts.